When you upload a cinemagraph, you can enter a caption and select a privacy setting to determine who can view it. Continue reading to learn more about privacy settings and sharing options. Sign in to your account on flixel.com to update your captions, privacy settings, and sharing options. Select View profile under the profile tab and select the cinemagraph you want to change the settings for. Select Edit to update your settings and Save Changes when complete. When you upload a cinemagraph, the embed code is available to viewers. Uncheck Show Embed to hide the embed code from visitors. Your monthly embed usage will be affected if a visitor embeds your cinemagraph to another website or blog. Business and Web+Apps subscribers can apply custom links to embedded cinemagraphs. 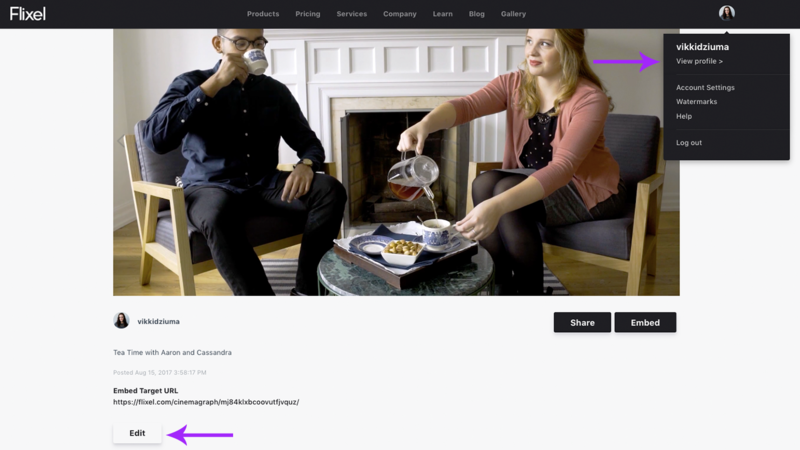 When a viewer clicks on an embedded cinemagraph, they are redirected to the embed target URL. By default, the embed target URL is a unique flixel.com URL. Enter a new URL or select No Link if you don’t want the cinemagraph to be clickable. When you upload a cinemagraph, social sharing is available to viewers. Uncheck Show Social Sharing if you don’t want your cinemagraphs to be shared on connected social networks. Business and Web+Apps subscribers can apply custom watermarks to uploaded cinemagraphs. Go to Adding Watermarks to Uploaded Cinemagraphs to learn how to add watermarks to your cinemagraphs.